This one volume edition of Living the Good Life and Continuing the Good Life brings these classics on rural homesteading together. This couple abandoned the city for a rural life with minimal cash and the knowledge of self reliance and good health. 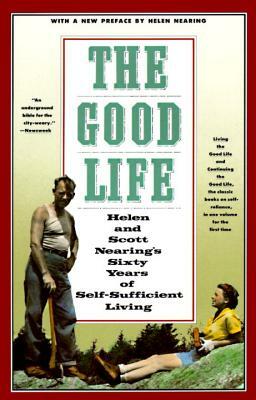 In 1932, SCOTT AND HELEN NEARING moved from New York City to rural New England. Over the next 60 years, the Nearings developed a system of living called "the good life," a Waldensian effort to be as self-sufficient and green as possible. They inspired others to do the same, and were involved in many social causes of their day. Despite his dedication to the good life, Scott was a radical economist, educator, writer, and political activist, and may be best known for his book, The Making of a Radical. The Nearings lived on earnings from the maple syrup and sugar they produced, and proceeds from Scott's lectures. "A prophetic account of the creation of a self-sufficient little Walden . . . that has been an underground bible for the city-weary." "The Nearings are plain daylight, solid prose, sound information." "As close to a Walden for out times as we're likely to see."